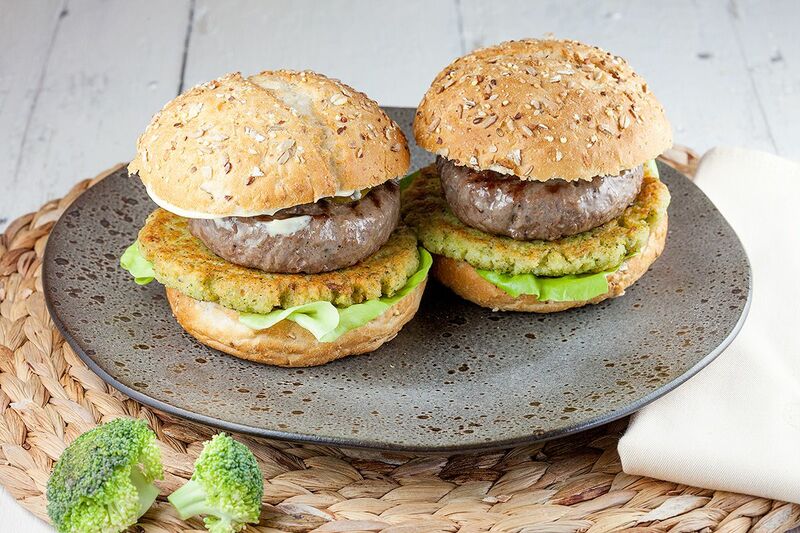 This awesome broccoli and beef burgers are quite filling, so they're perfect for a weekday meal. Basically it's 2 types of burgers on 1 bun, wow! PEEL the potato and slice into pieces. COOK the broccoli and potato, poke with a fork to check if they’re done. The smaller the pieces of potato and broccoli are, the faster they will be done. DRAIN the potato and broccoli and add to the food processor. PULSE until they’re no lumps left and add the egg and bread crumbs until it’s firm enough you can create burgers. SEASON with pepper and salt. 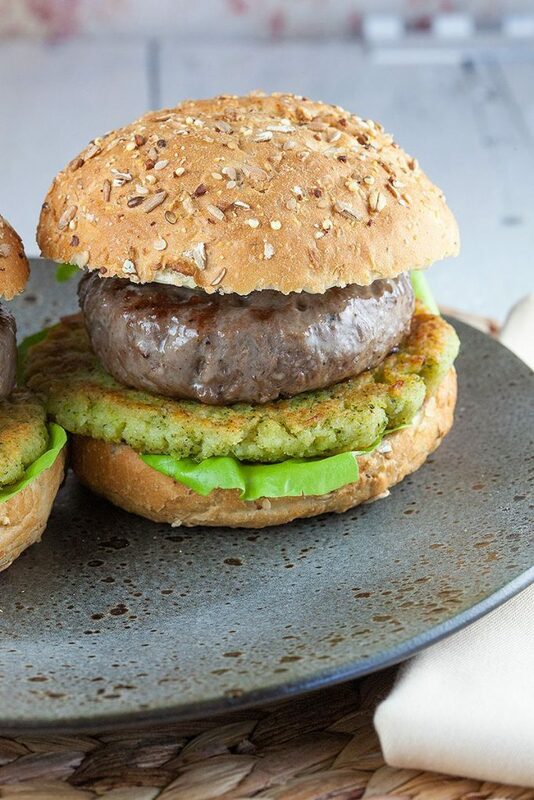 Use your hands to create flat burgers and place them on a plate or parchment paper. 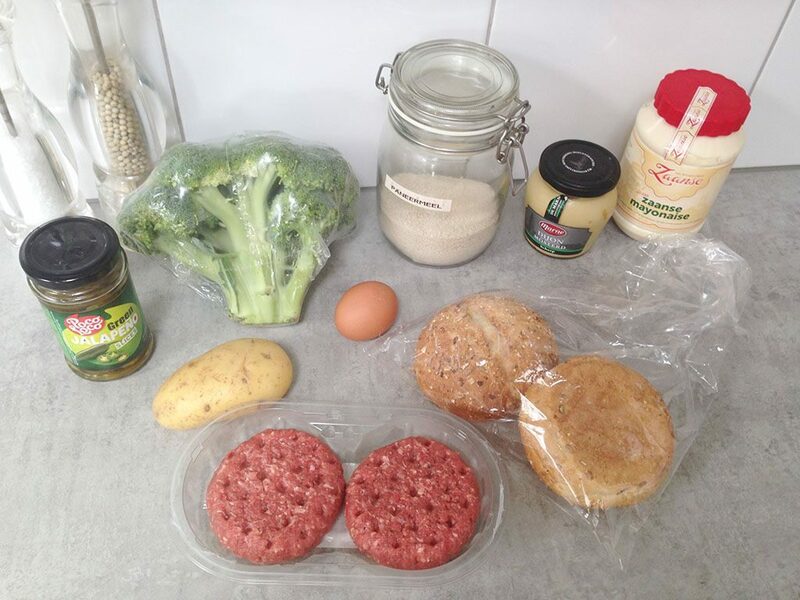 Let the broccoli burgers rest in the fridge until they’re firm, that will take about 20 minutes depending on the thickness. MIX mayonnaise and mustard for a very simple but delicious sauce. SPLIT the buns in half and smear the sauce on the top of the buns. DIVIDE lettuce on the bottom of the buns. HEAT the grill pan until hot and coat the beef burgers with a little bit of olive oil. GRILL the burgers about 3 minutes on each side, or until the grill pattern appears. Meanwhile HEAT olive oil in the medium-sized skillet and cook the thin broccoli burgers about 2 minutes on each side, or until beautiful golden brown. 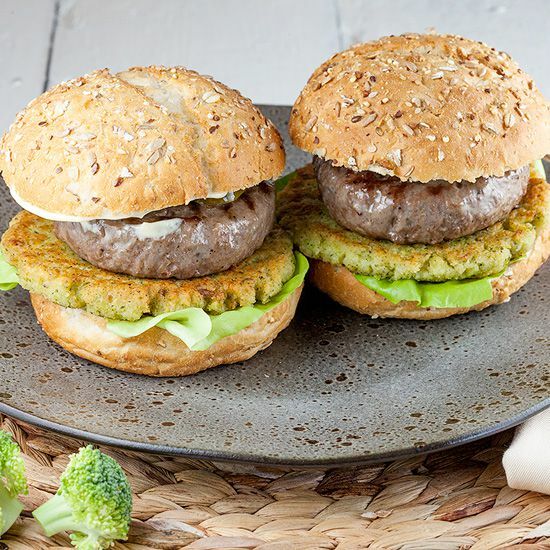 PLACE the broccoli burgers on top of the lettuce and the beef burgers on top. FINISH the burgers with jalapeño slices and the top of the buns. Enjoy! Mm, this sounds phenomenal! I love the healthy hint of broccoli! I can definitely see where that would be a nice kick to the recipe. Can’t wait to give this a try! Thanks for sharing the recipe! Thanks for the lovely comment! The broccoli really compliments the beef :) Hope you like it!